Produktinformationen "ASH VS EVIL DEAD SERIES 2 ASYLUM ASH 17,5 cm ACTIONFIGUR"
From the hit Starz TV series, Ash vs. Evil Dead! The series follows Ash, stock boy, aging lothario and chainsaw-handed monster hunter who spent 30 years avoiding responsibility, and the terrors of the Evil Dead. The Series 2 assortment includes Asylum Ash, Henrietta and Adult Demon Spawn. 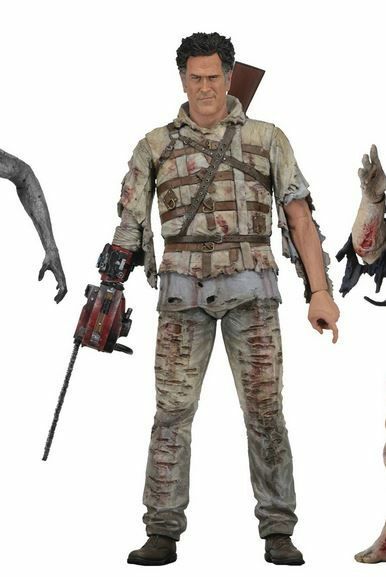 Asylum Ash comes with two interchangeable head sculpts and shotgun accessory. Henrietta comes with two interchangeable head sculpts, one of which comes apart to simulate her gruesome defeat by, you guessed it, Ash's chainsaw. The Adult Demon Spawn features plenty of gruesome detail and will have three variants with different heads. Figures stand approximately 7" tall and are highly articulated, with between 25 and 30 points of articulation each. Weiterführende Links zu "ASH VS EVIL DEAD SERIES 2 ASYLUM ASH 17,5 cm ACTIONFIGUR"
Kundenbewertungen für "ASH VS EVIL DEAD SERIES 2 ASYLUM ASH 17,5 cm ACTIONFIGUR"